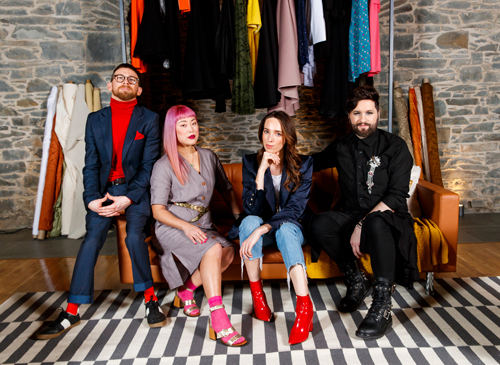 RTE 2’s exciting new series “The Fitting Room”, presented by Paddy Smyth, is on a mission to prove fashion can be fun and accessible for everyone – celebrating difference and ripping open the seams of what makes us individual. The 6-part series received funding support from Northern Ireland Screen. In each programme a trio of extraordinarily talented Irish designers and stylists (Ruedi Maguire, Zoë Carol Wong and Ciara O’Doherty) will invite members of the public into the creative hub, to help solve their clothing conundrums by creating bespoke outfits that will help how they look on the outside match how they feel on the inside. This ground-breaking series will turn what we think and know about style and identity on its head. The Fitting Room is a 6-part series, and will air on Mondays at 9:30pm from Monday 15 April on RTÉ2. The first three participants are welcomed in to The Fitting Room – Jenna Fitzgerald from Sligo, Robert Murphy from Cork and Hayley Fitzsimons from Waterford. Jenna Fitzgerald was paralysed below the waist in a diving accident in Spain 4 years ago, and is now a wheelchair user. Jenna rarely goes shopping as it’s too difficult to navigate stores, and makes most of her purchases online. Her wardrobe consists of stretchy materials for convenience, but she would love to find a dress that flatters her shape. Ultimately, she would love to gain confidence in dressing as a wheelchair user. A pharmacist by profession, Robert Murphy is a wannabe fashionista, but his athletic build means that some of his favourite trends don’t work for him. His peers and brothers often mock him for his lack of style, but he rises above, with one of his favourite outfits being a green jacket with red trousers. Robert has never owned a tailored suit, and his purple off-the-rail suit split at the groin during a night out, leaving his pants on show. Hayley Fitzsimons is a full-time athlete, and part of the Dwarf Sports Association Ireland. She competes in sporting competitions all over the world, throwing discus, javelin and shot put. She trains 6 days a week, so is often in tracksuits, but loves to dress up when she gets the chance. Hayley enjoys shopping, but it can be difficult to find things that fit her as she’s 119cm tall, and she would like to help the greater public and the fashion world understand the challenges that she and others face while shopping.